Some of Seattle’s wisest, wonkiest City Hall watchers were taken by surprise by an announcement from the office of Mayor Ed Murray Tuesday that the current Neighborhood District Council system will be reworked into what the press release called the Community Involvement Commission. The announcement comes days before a consultant hired by the city to evaluate the district council system was set to give recommendations for change. UPDATE: Murray said Wednesday a process has begun to remove city support and resources for the neighborhood district councils. The councils might live on but they will do so as independent bodies. Focus groups will be formed to determine the best path to dissolving the city’s ties. The aim is to have legislation moving forward by fall to restructure the city’s relationship with neighborhood groups. “Seattle must, as it was three decades ago, be on the cutting edge of innovation by creating new community engagement processes,” said Mayor Murray at Wednesday’s press conference. Murray said that Seattle needed ways to better engage people not represented by the councils, such as young people, renters, immigrants and minorities. “They shouldn’t be cut out of the discussion of how we as a city make decisions,” said Murray. The mayor’s executive order instructs city departments to “implement more inclusive and equitable engagement practices.” The initiative will be led by the DON. The city is severing formal and financial ties to the district councils, and resources previously allocated to those councils will be re allocated to engaging with neighborhood community groups more broadly. Officials Wednesday said that part of what the Community Involvement Commission will determine over the coming months will be how and where those resources should be redistributed. The current review of the district council system was put in place in part to address concerns that the district councils do not fully represent neighborhoods; for example, people who work evening shifts or cannot afford public transportation would find it very difficult to attend the district council meetings. “There were concerns that the East District Council doesn’t fairly represent minorities,” said Taylor. In June, a City Council committee heard preliminary details on a report that took a hard look at how representative the district councils were. The report did not include results for the East District Council. In 2016, DON will spend over $1.2 million dollars on the council program “for outreach and engagement to Seattle residents,” according to the report. The neighborhood councils are currently City of Seattle-supported components of City Hall’s community process to vet certain proposals and grant applications. The system is part of the fuzzy cloud of “community” Seattle’s leaders refer to when they say they are acting on “community priorities” or tell you the “community has spoken.” The neighborhood council system mostly busies itself with city grant processes these days — the East group has been vetting these proposals for safer 10th/John crossing to Capitol Hill Station, Melrose enhancements as part of the Neighborhood Park and Street Fund process. There are also times when there isn’t much business to attend to. A driver for change may be a response to parochial fights driven by local councils across the city. A group in Queen Anne, for example, has successfully delayed the city’s plans to loosen up development of backyard apartments. They’re targeting HALA next. The Capitol Hill Community Council, meanwhile, is a bastion of progressiveness in comparison. But the community councils aren’t formally attached to City Hall processes like the current neighborhood district councils organized by the Department of Neighborhood. A spokesperson from the mayor’s office said that the Community Involvement Commission is intended to address the concerns of unequal representation in the district council system. However, he said that the mayor’s announcement was the beginning of a process that will involve community input. “This isn’t like we’re installing a brand new system that’s going into effect tomorrow,” he said. A more clearcut driver for change came with the change in how Seattle elects its City Council. 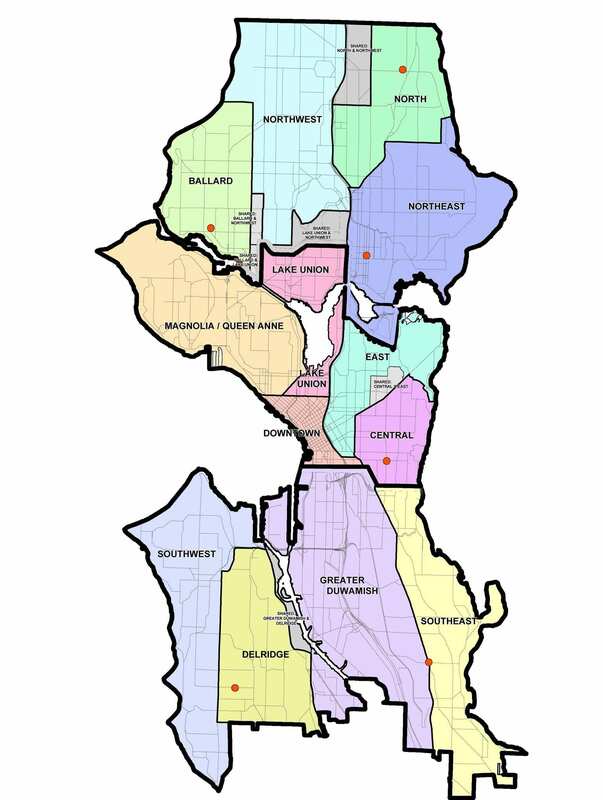 The neighborhood district council system is a holdover from the time before Seattle moved to district representation on the City Council. CHS looked at how the neighborhood councils needed to change to mesh with the new District 3 world here in 2015. This overhaul could be the answer. The mayor is schedule to announce details of the new system Wednesday afternoon. Amanda Helmick, a West Seattle community activist and chair of the Delridge District Council, was very apprehensive about the mayor’s announcement. “The timing’s a little interesting,” she said. The district councils were supposed to be reviewing feedback on the existing system this week. Department of Neighborhoods director Kathy Nyland was set to speak to at the Capitol Hill Renter’s Initiative meeting Wednesday about the department of neighborhoods and the district council system, as well as the “recent review of how to make the district councils and neighborhood engagement generally more inclusive of renters and other groups that haven’t been well represented.” Nyland’s appearance at Wednesday night’s meeting was planned before the mayor’s announcement was scheduled, CHS is told. Helmick said that she was frustrated in part because this is not the first time the system has been reviewed. There was an audit in 2009 that made recommendations for changes to the system, but Helmick said to her knowledge most were never implemented by the city. The mayor’s spokesman said that the Community Involvement Initiative would be largely a Department of Neighborhoods-led effort. Mayor Murray is speaking on the initiative at a press conference at 2:30 PM Wednesday afternoon at City Hall, and will be joined by representatives from the Department of Neighborhoods. This entry was posted in News, etc. and tagged city hall, district 3 by Mariah Joyce. Bookmark the permalink. Amazingly enough the race/ethnicity bar chart shows that the CD council does indeed reflect the racial make up of the CD. This was obviously a power grab. The City had hired a consultant to make recommendations about improving the system which I think was due 2 days after he killed the existing system. Grant applications will now be vetted by people that the Mayor has chosen instead of neighbors elected by their neighbors. The District Councils are made of Community Councils and other organizations within the District. These organizations meet at whatever time works for their members. Squire Park meets on Saturday morning. Central Area District Council recently admitted the Union Street Business Association as a voting member. It is an African American Business Association. These organizations elect a representative to be a voting member of the District Council. If the Mayor’s true goal is to increase diversity and participation then why didn’t he give the existing grass roots organizations the tools that he is so ready and willing to give to his hand picked crew? Why didn’t he wait until the City’s own consultant presented their report? He has alienated every Community Council in the city. Community Councils has been the birthplace of the political careers of Mayors and City Council Members. I guess the one good result of the City cutting ties is that the District Councils will now be able to endorse Mayor Candidates. His greatest legacy will be putting in place the system that will end his career. I smell a rat. A very big rat. Another reason not to trust this mayor. I have yet to find one single District Council member who remembers taking a demographic survey in 2013. Becoming a member does not require this information…so where did it come from?